Frame and guide rollers are often the cause of belt damage, which reduces the lifetime of the belt. The Rulmeca belt tracking roller requires no maintenance and fits into a standard drop bracket. The Rulmeca Centralising Return Pulley can be manufactured to suit all belt sizes in operation, in any country. Special design requirements, such as specific shaft dimensions and lengths, are possible at little or no additional charge. The Rulmeca belt tracking roller is a quality product that is made of precision-turned C.N.C. components. Special hardened steels and other alloys ensure that the Rulmeca belt tracking roller performs optimally over an extended period of time, in the toughest conditions. 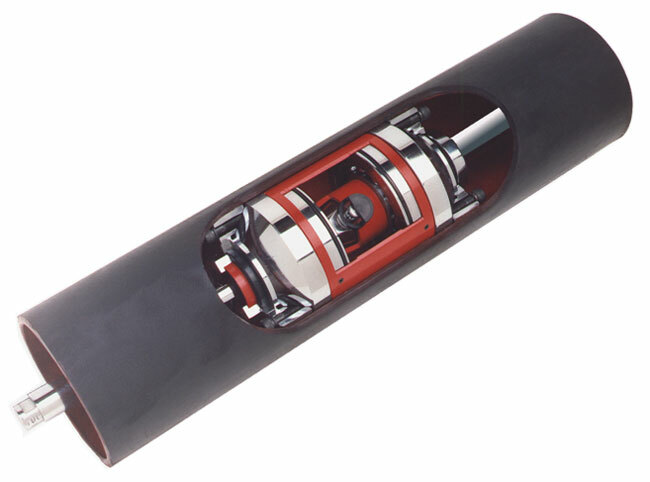 The bearings in the Rulmeca belt tracking roller continuously run in oil thus prolonging its life span. The Rulmeca belt tracking roller is a fully serviceable product and carries a 2-year warranty! It does not need to be discarded but can be reconditioned. (Please apply for terms and conditions).